By the time of the Pacific War, the population of most of the major powers was heavily urbanized. China was a notable exception, with much of its population still living as peasants in the countryside, as was also true in much of southeast Asia and the islands of the Pacific. However, there was intense urban combat in Manila during the second Luzon campaign and on a smaller scale on some of the more developed Pacific islands and in Burma, and the Americans launched a major strategic bombing campaign against the urban areas of Japan. Urban combat was dreaded by soldiers because the restricted fields of fire made for very close combat with a high percentage of fatal wounds. Its particularly vicious nature was made worse by the presence of large numbers of civilians who often could not evacuate in time to avoid being caught up in the carnage. 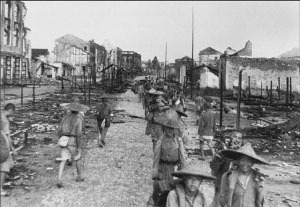 In some cases the deaths of civilians was a deliberate feature of urban warfare, as was clearly the case with the Japanese massacre of civilians in Manila. Military commanders preferred to bypass cities rather than take them by storm, since the close quarters fighting tended to nullify superior firepower and favor the defender. Once cut off and surrounded, the population of a large city was vulnerable to siege. Unfortunately, there was often strong political pressure to take a city, as was the case with both Manila and Mandalay, and cities were usually the center of the local communications network and thus difficult to bypass. Cities might also have port, airfield, or other facilities badly needed by the attacking force, making a time-consuming siege unacceptable. Urban Combat Tactics. Cities were almost ideal for defense because the many structures provided excellent cover and were relatively easily fortified. The urban battlefield was highly compartmented, and the attacker had to secure each compartment in turn. A tenacious defender often had to be blasted out with bombs, artillery (often using direct fire at short range), and finally small arms and grenades. MacArthur's attempt to spare Manila widespread destruction by holding back artillery and air support led to high casualties among the infantry with little progress clearing the city, and MacArthur eventually was forced to relent and permit his subordinate commanders to use their full artillery firepower. The city was cleared, but in the process it suffered the worst destruction of any Allied city in the Second World War except Warsaw. Tanks provided valuable direct firepower for destroying enemy strong points, but they were highly vulnerable in the restricted space of an urban battlefield. It was relatively easy for a defender with antitank weapons to ambush a tank from above or to the rear, where its armor was thinnest. It was also relatively easy for infiltrators to reach a tank with shaped charges or other close combat antitank weapons. The counter was for the attacker to keep infantry close to the tank to protect it, but the infantry were then dangerously exposed to enemy fire. The Japanese took heavy tank losses in the early urban battles of the war against China. However, tanks proved useful when attacking walled cities as a way to envelop the city and cut off the retreat of the defenders through its back gates. Civil defense. One of the most dreadful developments prior to and during the Second World War was the strategic bombing of cities. Such attacks resulted in heavy civilian casualties, even when carried out in daylight against specific industrial targets. Civil defense encompasses various measures taken to protect civilians from military actions, including strategic bombing. The United States, New Zealand, and Australia were almost unique among the major powers in being spared most of the horrors of strategic bombing. The United States did experience some minor bombardments and bombing raids from Japanese submarines on the West Coast, as well as the balloon bombing campaign, but damage was slight. Australia experienced some heavy raids against ports on its sparsely inhabited north coast, such as Darwin, but these were tactical raids aimed at military targets. The main islands of New Zealand were essentially untouched. Nevertheless, all these powers took precautions against the possibility of air raids against their population centers, as did the other major powers involved in the Pacific War, all of whom endured significant strategic bombing. China was the first power to be subjected to a prolonged strategic bombing campaign, directed by the Japanese largely against Chungking, though around fifty other cities were bombed at one time or another. Civil defense was primitive, consisting of a few large underground shelters and a much larger number of improvised cave shelters, carved into the karst limestone on which the city is built. Such shelters provided good protection from all but a direct hit, which could cause the shelter to collapse. Japan was shockingly unprepared when its own turn came. Although air raid drills were frequent after July 1941, they were largely morale-building exercises, and fire departments remained heavily dependent on volunteers. Attempts were made to expand fire departments, but new recruits were poorly trained. Tokyo's fire department expanded from 2000 to 8100 men, of whom 2700 were older boys. This was still grossly inadequate, but there was insufficient manpower to expand to a proposed 12,500 firemen, nor could they possibly have been adequately trained. From 1943 to 1945 the equipment availale had had expanded from 280 trucks, cars and portable pumps to 1,117, which represented almost the entire wartime production of such items. The pumps included a few large American pumps from the 1920s and 559 domestically manufactured 450 gallon per minute (1700 liter per minute) pumps. Heavy equipment was shockingly limited, with each fire company having just two 12' (3.7m) ladders and no fire extinguishers. The waterfront had just 11 pumper boats with 500 gallon per minute (190 liter per minute) pumps. By contrast, New York City had a force of more than 9000 well-trained firemen equipped with much higher capacity pumps and a system of over 91,000 fire hydrants, and a force of 12 pumper boats with at least 7,000 gallon per minute (26,500 liter per minute) pumps. And New York City was never seriously threatened by strategic bombing. In 1945, Tokyo had just 18 concrete air raid shelters with a combined capacity of 5,000 persons. The coastal plains on which most of Japan's cities were built were composed of unstable soil derived from volcanic ash, which hindered excavation. The only shelter for most civilians was bokugo, small holes six to 15 feet (two to five meters) long, three feet (one meter) across, and four to six feet (1.5 to 2 meters) deep, with bamboo roofs covered with a thin layer of dirt. These were dug next to homes or along streets, and proved almost useless. Tokyo authorities had ordered the demolition of some 207,370 homes to produce 31 miles of firebreaks by March 1944, but in many cases the timber from the demolished homes had not yet been removed.